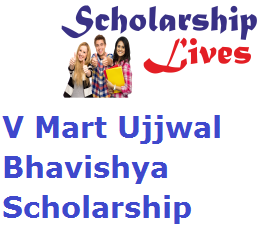 V Mart Ujjwal Bhavishya Scholarship Application form will soon available for all class 10th passed students from recognized board whether State/ CBSE/ AICTE. The main objective of the organization is to help the meritorious students who need financial aid and from a weedy economic background. If you are also one of the students who come from a poor family background then grab this great opportunity and apply online for V Mart Scholarship 2019 before the last date through the pdf which is mention at the bottom of the page. V –mart is one of the Popular biggest retail chains in India with more than 150 stores extensively spread across 14 states of the nation. This year, V-Mart has initially issued V-Mart Ujjwal Bhavishya Scholarship which provides a financial aid to various under sections of the society. Applicants must have passed class 10th from recognized board whether State/ CBSE/ AICTE. Parent’s income should not exceed 2 lakh per annum. Under this scholarship Scheme, Rs 10,000 each will be given to 750 meritorious students covering school admission up to class 11th. Students can fill their form online or offline. After filling, take a printout of your application form.